Does a look back at the personal qualities and behaviour of one of Britain’s foremost military leaders tell us anything other than that he was human? When I graduated, oppositional defiance disorder had yet to be ‘discovered’. Borderline personality disorder, autism/Asperger’s syndrome, and ADHD were still obscure footnotes. Today, mental disorders dominate explanations for ‘problem’ behaviour. Explanations from mainstream psychology, such as social learning or perceptual set, barely register in the public perception. A spin-off from this growing medicalisation is the fashion for re-interpreting the lives of dead celebrities in terms of newly-discovered mental disorders. Perennial favourites for retro-diagnosis include Adolf Hitler, Marilyn Monroe and Princess Diana. Even the widely-respected historian Antony Beevor has been lured into amateur psychiatry. In promos for his 2015 book Ardennes 1944 he argued that Field Marshal Bernard Law Montgomery (1887–1976), Britain’s best-known military leader of the Second World War, had Asperger’s syndrome (now autism spectrum disorder). The autism diagnosis is predicated on several overlapping claims. Montgomery was unable to perceive the sensibilities of others, especially subordinates that he fired. His approach to military matters was inflexible. And he often displayed social clumsiness, tactlessness and condescension. So, are these assertions fair? And, if so, do they denote autism? Well, first a caveat. Diagnosing mental disorders in dead people that a clinician has never met is startlingly ambitious – a bold variant of the ‘popular psychiatry’ that Niles Crane (in the sitcom Frasier) once scorned as ‘McAnalysis’. But let’s accept, for the purposes of this discussion, that it is possible to diagnose mental disorders from biography alone. Then we can assess the evidence, and also juxtapose psychiatric and psychological approaches to problem behaviour in historical figures. Let’s first consider Montgomery’s relationships with his subordinates. Undoubtedly, Montgomery did criticise subordinates in emotionally insensitive terms and he did fire the inadequate peremptorily. But his preference for blunt criticism over social niceties was entirely typical of the senior military leaders of his era. ‘Monty’s’ American contemporary and intense critic General George Patton was at least as intolerant of inadequate subordinates; General Omar Bradley – despite his charm – also fired subordinates without hesitation. Russian, Japanese and German field commanders occasionally executed subordinates who failed them. So, yes, the prima facie autism case can be made, that Montgomery spoke bluntly and he fired people peremptorily. But so too did every other successful general in history. Meanwhile, non-autistic, explanations for Monty’s insensitive behaviour are not difficult to find. Military leaders are appointed to exercise ‘grip’ over a battlefield, kill enemies and win wars – in circumstances of immense responsibility, where small mistakes will cost lives. Why would we ever expect them to tolerate inadequate subordinates? And perhaps more pertinently, willingness to fire inadequate subordinates is an essential part of getting to the top and staying there. It is why television’s most notorious serial-sacker, Sir Alan (‘you’re fired’) Sugar, is lionised as a business guru rather than diagnosed as autistic. A second argument advanced for Montgomery’s autism is that his military thinking was inflexible – and that this inflexibility resulted from autism. Certainly, Montgomery’s soldiering was characterised by painstaking preparation rather than flair. But to confuse the cautious solidity of a man responsible for thousands of lives with the rigidity of clinical autism is ludicrous. Monty was no Wellington and probably no Rommel, but an autistic Montgomery could not have successfully commanded a platoon. And, again, contradicting evidence is ignored. Montgomery’s military response to the German Ardennes offensive of December 1944, for example, was indisputably ‘flexible’. This military emergency, and the animosity it provoked, brings us to the third plank of the autism case – the view that Montgomery’s conflicts with peers and superiors were caused by social ineptitude so great that it can only be understood as autism. 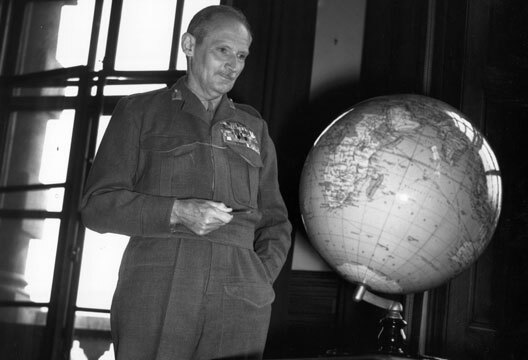 Yet Montgomery’s input to these conflicts arose mostly from a three-part conviction: first, that he was the best general available to the Western allies; second, that if he were given a free hand to run the West European campaign the war could be concluded much sooner; and, third, that it was his duty to point these facts out. Unfortunately for Montgomery’s ambitions, the Americans were funding the war and therefore an American, Eisenhower, was in charge. Until December 1944 this reality had been tacitly accepted by all, including Montgomery. But then things went badly wrong for the Americans. In a prepared press briefing about the ‘Battle of the Bulge’, Montgomery dutifully supported Eisenhower – but in ‘off-piste’ remarks he observed that he would have done it all differently. The American military reverse, he averred, could have been avoided if only his superiors had put him in charge, employing his greater experience in fighting Germans. This braying boastfulness, amplified by the jingoistic British Press, caused his American peers – a group of men never short of vanity themselves – to loathe him. Was autism to blame? To simplify matters, let’s ignore the equivalent vanity and petulance of Montgomery’s American peers. Let’s also ignore their contribution to the animosity (Bradley and Patton, for example, threatened to resign rather than serve under Montgomery). Then we are left with Montgomery’s patronising condescension, his boastful conceit and politically naive self-promotion. But even if we were to accept that these personal failings account entirely for Montgomery’s troubled relationships with superiors and peers this is, surely, an alternative explanation to autism – unless using the phrase ‘if they’d only listened to me’ indicates autism? Thus, taken overall, Montgomery’s diagnosis tells us more about loose clinical thinking than about the man himself. Awkward inconsistencies are ignored. He is judged in isolation from his peers. The notable self-awareness of his 1958 memoirs is ignored. Montgomery’s military caution is attributed to rigid thinking rather than to his enormous responsibilities. His conflicts with his peers are simplistically attributed to autism, although conflicting vanities offer a much more direct explanation. In short, the use of evidence is highly selective, favouring evidence that appears to support the autism diagnosis. This over-readiness to ‘detect’ autism would be less worrying if there were an objective test by which an incorrect diagnosis might be disproved. But there is none and clinicians seem not to be very bothered. It is a modern scenario that residents of 17th-century Salem would recognise immediately. They too faced allegations based on untestable intuitions about ‘odd’ behaviour; and, like supposedly autistic people, there was no test they could invoke to prove that they were not on the witchcraft spectrum. Still, criticism is the easy bit. Can ‘non-disordered’ explanations account for Monty’s problem behaviour better than autism – and maybe tell us something about military leaders in general? We could sensibly start by looking at characteristics that Montgomery shared with his peers. From biographies we could make a good case that Montgomery’s robust self-belief is common in successful military leaders. So too are determination, personal bravery, patriotism, hunger for glory and intolerance of failure. These should not surprise us… without such characteristics a military leader would never reach the top in that intensely competitive profession – nor make tough decisions that end with people being killed. So how do these characteristics develop? If not autistic, could senior leaders (military and even non-military) be ‘psychopaths’? It’s certainly a very fashionable view. But much simpler explanations for the development of ‘tough-minded’ values and ‘problem’ behaviours can be found in mainstream psychology – particularly in the interaction of individual social learning, socio-political circumstances and inbuilt psychological processes (especially frustration-aggression, stereotyping and cognitive dissonance). If 20th-century history demonstrates anything at all, it is how often a ‘bad mix’ of these elements has been disastrous – turning millions of ordinary people into self-justifying participants in mass killing. The 20th century has witnessed genocidal massacres in Bosnia, Rwanda, Japanese-occupied Manchuria, Nazi Germany and many other places. And the evidence overwhelmingly suggests that they resulted from social learning, stereotyping, cognitive dissonance, dehumanising and socio-political circumstances – not mass psychopathy. In this context, it is surely not too Laing-ian to believe that the most plausible explanations for Montgomery’s boorish ways can be found in his social learning and socio-political context, rather than the DSM-5. The other central psychological characteristic that Montgomery probably shared with his warrior peers (and certainly with Winston Churchill) was that he rather enjoyed war. So, can enjoying war be interpreted as mental disorder? Again, no… lots of people enjoy war and fighting. Some join gangs, revolutions and armies for adventure, glory and challenge. Others participate in fighting because they are bored or frustrated. Yet others obtain their fighting pleasures vicariously – through violent sports or video games, or through war-films and murder novels. To some extent, our enthusiasm for fighting is because humans – like other species – have agonistic/competitive behaviour hard-wired for its adaptive value. But countless people from Alexander the Great to Sergeant Alexander Blackman have also learned within their cultures that warfare is comradely, heroic and glorious. This social learning never presents us with one single message, of course. So while some parts of our culture insist that war and fighting are exciting adventures, other parts of our culture insist that war and fighting are abhorrent. And many of us end up thinking that war and fighting are both – exciting and abhorrent. There is, of course, no ‘correct’ truth here… all we can say with certainty is that fighting and competitiveness are among the things that bring complex shades of fulfilment, meaning and happiness to many people. And Montgomery was one of them – a gifted but charisma-free warrior. Was his boorish behaviour the result of autism – or the result of social learning, social context and universal psychological processes? If we view his failings without the amplifying and isolating spotlight of his historical importance, and if we credit him with the positive qualities ignored by his diagnosticians, we are left with a net psychiatric status that could probably be applied to most of us – stark, raving normal. - Dr Chris Timms taught psychology at colleges and universities for 25 years.